Internet usage on school and library campuses is skyrocketing. Millions of devices are coming online, and more students and library patrons are connecting than ever before. This digital revolution is transforming our nation’s educational system, and the E-rate program has played a significant role in bringing about these changes. However, unnecessary regulations are holding back progress. 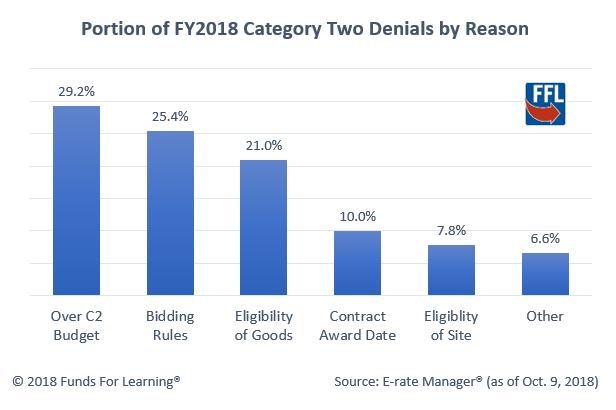 Nearly a third of FY2018 applications have been denied because of an arcane rule requiring projects be reduced in scope to meet a site’s Category Two budget. Library patrons and students should not be denied Wi-Fi by a set of policies and procedures. Now is the time for the FCC to fight back against these regulations. Imagine you have a $10 gift card to spend at Starbucks. You and your friends place an order and the total comes to $15.25. How do you handle this situation? Do you tell the barista to reduce coffee sizes and remove the muffins from your order? Probably not. Most likely, you hand them your gift card, along with the extra $5.25 needed to cover the costs. But Category Two regulations do not work that way. Instead of making E-rate applicants pay the difference on their order, the regulations require that their order be reduced. Items are eliminated, and quantities are changed to meet the budget cap at each site. Alone, this would be bad enough, but this is not the worst of it. If an applicant does not understand the requirement to change their order, the project is denied funding altogether. Yes, that’s right. If the quantities, items, or unit costs are not reduced below the cap, the project stops. Can you imagine if Starbucks cancelled your order if you did not reduce it? Yet this is what the current Category Two regulations are doing to schools and libraries every day. Unfortunately, this is not some rare occurrence. On the contrary, it is the most prevalent reason that Category Two projects are denied. As shown in the graph below, these Category Two budget cap denials are the most prominent reason that applicants are denied funding for Category Two projects. One would expect to see denials for violations of competitive bidding or contract award violations; but for budget caps to even be a reason for denial, let alone the top reason, is unfathomable. Yet, for the second year in a row, more projects are denied for this reason than any other. Fortunately, there is hope on the horizon. Last fall, the FCC sought public comment about the Category Two regulations and, last winter, Funds For Learning filed additional comments specifically about the Category Two budget cap denials. Libraries and schools are working hard to bring broadband to students and adult learners. The E-rate program is the key to that success and now is the time for the FCC to put an end to the draconian Category Two budget cap denials.